Home grown tomatoes are the best of example that nothing tastes as good as what you grow yourself! The varieties you can grow in your garden may not store as long as shop bought ones – but they will be tastier and full of flavour! Tomatoes come in a wide range of sizes, shapes and colours. Smaller tomatoes, like grape and cherry varieties are great in salads and the plants tend to be more disease resistant. Large varieties like Beefsteak tomatoes are heavier and are great for sandwiches. 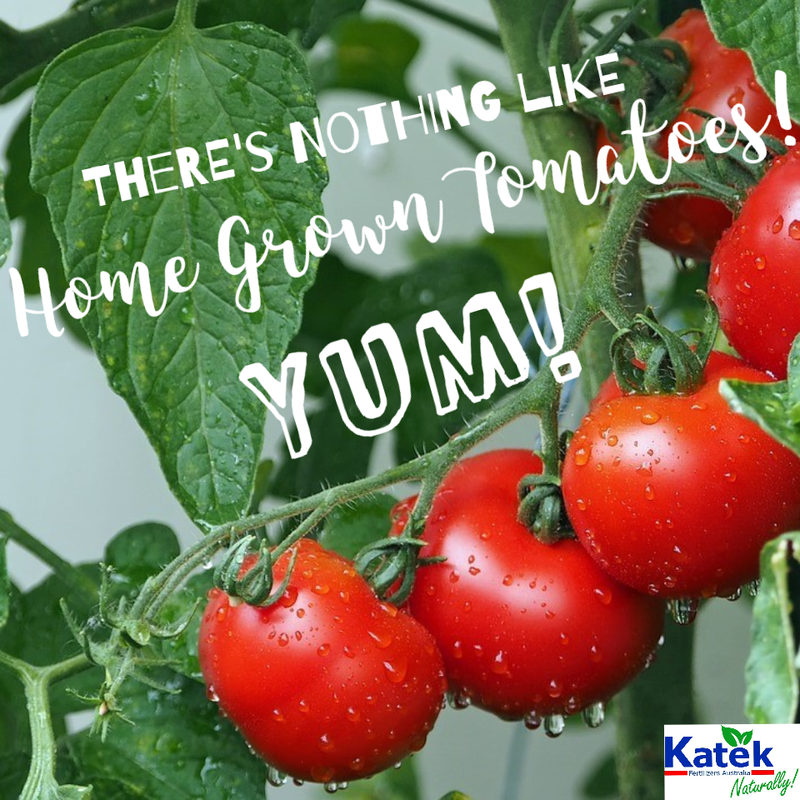 Roma tomatoes have fewer seeds and a lower moisture content, which makes them great for making sauce or paste or drying to make pizza toppings. Tomatoes have a long growing season, with generally 60-100 days to harvest. Tomatoes need at least six to twelve hours a day of sunshine. Warm weather is the key to productive fruiting, so plant in the warmest, sunniest spot in the garden. The larger varieties generally prefer more summer heat than smaller varieties. Tomatoes do not tolerate frost, so plant out after any chance of frost has passed. If you live in a cooler region, starting the tomatoes off inside can mean your seedlings are ready to plant out when the warmer weather arrives. TIP: Dig in some composted poultry manure into the soil when planting. Super Booster or Super Growth Pellets are ideal. Tomatoes like nitrogen when they are starting their growth phase, so adding a fertiliser to the soil is an ideal way to ensure they get the nutrients at the most effective time. Climbing varieties will need staking or trellising. To allow plenty of air and light to flow around the plants, plant around 50-60cm apart. Feed seedlings with a seaweed concentrate to get them established and avoid transplant shock. Once you have either planted seedlings or sown your tomato seeds water to ensure the soil is moist for growing. Early morning watering is ideal as the plants have a chance to dry out during the day, making them less susceptible to disease. Due to their deep roots, Tomatoes prefer a deep watering every few days rather than a light watering every day. Overwatering can make the fruit crack and the leaves of the plant can become blistered and bumpy. TIP: Tomato plants love infrequent deep watering. 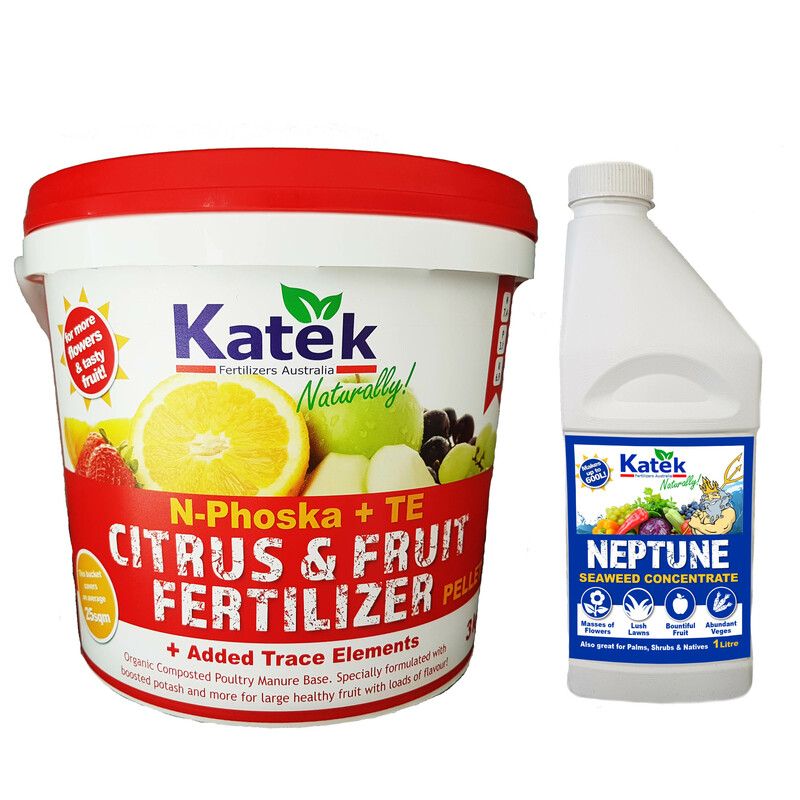 A good balanced fertiliser like Katek Super Growth or Citrus & Fruit is ideal as it contains a range of nutrients including sulphate of potash which helps to produce delicious fruit and sustain flower production throughout the season. This pelletised fertiliser can be dug into the soil prior to planting or applied every four-six weeks throughout the growing period. Fortnightly application of a seaweed concentrate like Neptune is also recommended to strengthen the plant against pest and disease pressure and for overall plant health. Neptune can be applied to the soil and foliage. TIP: Seaweed concentrate is a great plant tonic, helping build resistance to pests and disease. Regular mulching will protect the plants from the heat of summer, keeping the roots moist and cool. Keep mulch around 1-2 inches away from the stem, forming a well like area around the base of the stem. Crop rotation is important with tomatoes. Pests and diseases can build-up in the soil and can pass from one crop to another. By rotating your tomatoes with other plants, you can keep nematodes and other nasties at bay. Seaweed contains natural growth stimulants, which make the plant stronger and less prone to disease. A liquid seaweed like Katek Neptune is used to help defend plants from soil borne diseases and help increase yield at the same time. See Next Article in How to Grow Series!